WELCOME TO THE FASTEST GROWING WATER SPORT IN THE UK. Beginner SUP Lesson covering Equipment, Safety, Kneeling and Standing up, Board control and Paddle Techniques. All equipment is provided, SUP, Paddle, Leash and wetsuit. The experience itself is a cross between surfing and kayaking, it's origins coming from Hawaii. You are standing on a large surfboard, while using a long paddle to push you along. This is surprisingly easy to master after a bit of professional tuition. 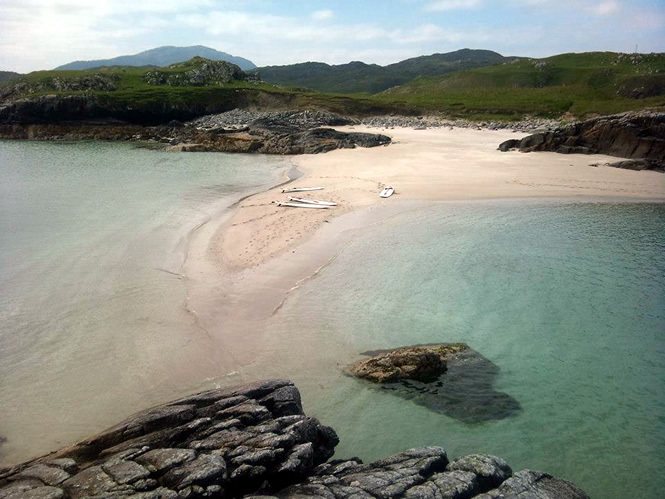 Once you have the basic skills, usually after 1 hours' tuition, we will take you on a unique Hebridean adventure to one of our great locations. The location will depend upon wind and tide conditions on the day. Having this stand up platform gives the person a great view of the water and surrounding scenery from a standing position, it almost feels like you are walking on water! Our tours are designed to give you a great all round experience, getting close to nature while experiencing the joy of Paddleboarding. All tuition and tours are led by local ASI SUP Level 3 coaches, experienced in water safety and first aid so you're in good hands. Combine this with local knowledge of the environment of these beautiful islands and you're in for a treat. There are a variety of locations available for the tours, some focusing on island hopping, some on harbours, some more on wildlife spotting birdlife, seals, otters and even eagles! All these tours are based on flat water areas, you will learn the skills of SUP'ing, from familiarity of equipment and environmental awareness to standing and paddling techniques. Tours are run on a minimum of 2 and a maximum of 6 people. Children must be over 12 years old and accompanied by a parent or guardian. To sum it up, this is just a great way to see the islands, it's easy to learn and accessible, if you fall off, you just climb back on, wetsuits are provided! The SUP boards we provide are ideal for beginners, offering a stable platform to learn from. So come and join us and learn to SUP! Thank you so much for today Cheggs! The SUP tour was brilliant, couldn't have been a more beautiful day. This was our first time, we'll definitely be back! SUP gift vouchers are £40 plus £1.99 postage (recorded delivery). Buy them here, making sure to include the address for the voucher to be sent to.